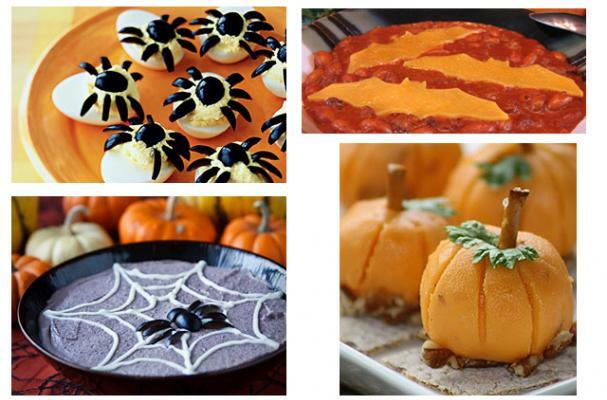 Foodista | Spooky Savory Gluten Free Halloween Treats! Entertaining this Halloween? Not impressed by a smorgasbord of sweets? Here is the answer to all of your gluten free recipe prayers! This All Hallow's Eve, whip up any of these quick and easy savory treats, sure to terrify your family and friends! A super quick and easy way to creepify your chili! With black beans for a creepy purple color, yogurt and black olives for a spider and his web, this super easy (and healthy!) appetizer is a must-make. Another quick and easy way to dress up your food! Simply turn black olives into spiders and you have a terrifically terrible treat. Turn soft cheese into pumpkins for a bite-sized bit of Halloween fun. Stuffed olives wrapped in puff pastry make for an easy treat to terrify your guests. Also, be sure to check out this recipe for gluten free puff pastry!